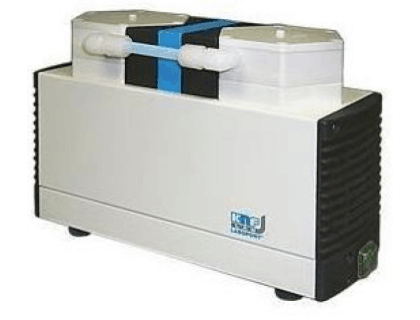 Learn more about the Ace Glass, 14101-04 Vacuum Pump with pricing, features, and frequently asked questions. The Ace Glass, 14101-04 Vacuum Pump is a diaphragm pump that uses vacuum pressure to push liquids through a system. The pump is strong enough to process thick, viscous chemical solutions without being damaged. All 2-stage head design for smooth efficient performance. Pros: Chemical resistant. 115v motor. Smooth performance. Cons: Pump unit is not compact. Bottomline: The 1401-04 Vacuum Pump is a strong, durable pump for heavy duty applications. The Ace Glass 14101-04 vacuum pump costs $754.00. Will the 14101-04 pump be damaged if chemicals run through it? The pump is designed to process chemicals, so all of the internal moving parts can come into contact with a wide variety of chemicals without being compromised. What temperature range can the Ace Glass 14101-04 handle? The pump can handle temperatures that range between 5 and 40 degrees Celsius. What are some Ace Glass, 14101-04 Vacuum Pump alternatives? Alemite, 8322 1/2" Diaphragm Poly Pump, Buna Diaphragm Material. Alemite, 8322-C 1/2" Diaphragm Poly Pump, Teflon Diaphragm Material.